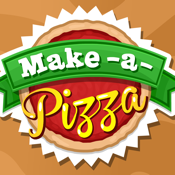 Make you own pizzas with 40 toppings to choose from. You can name and save all your pizzas - and easily email or tweet them to share with your friends. You have all the classic pizza toppings to choose from like pepperoni, ham and pineapple - plus some weird and yucky ones to choose from like stinky cheese, ear wax and candy sprinkles. There are no in-app purchases - it's all free. Enjoy.